Watch out! Happy Birthday Author has been hacked! Hi everyone, it is Lisa, Eric's wife. For the first time in 5 years, I am allowed to type, not just edit a post! For five years, we have been celebrating author birthdays in our home. Four kids later, and many celebrations, I have come to own my place as part of the Happy Birthday Author family. People know Eric when we are at book signings, book festivals, or other book related events as "Happy Birthday Author, "The Happy Birthday Author Guy" (coined by Bob Staake) and "the dad who writes about authors and does cool things with his family. I am referred to as "Happy Birthday Author's wife" when we meet authors or other people who know Eric as "that Author Guy." What many of the people, authors and illustrators we meet may not know is that Eric is an author himself! We first celebrated his birthday on Happy Birthday Author in 2012, just after our fourth baby was born, and his Three Ghost Friends series first came out. A friend, and fellow author, Colleen Kessler helped us celebrate Eric's first birthday as an author. Fast forward 3 years, and here we are again! In 2013, Eric started dabbling with another story, and wanted to try his hand at illustrating the whole book himself. 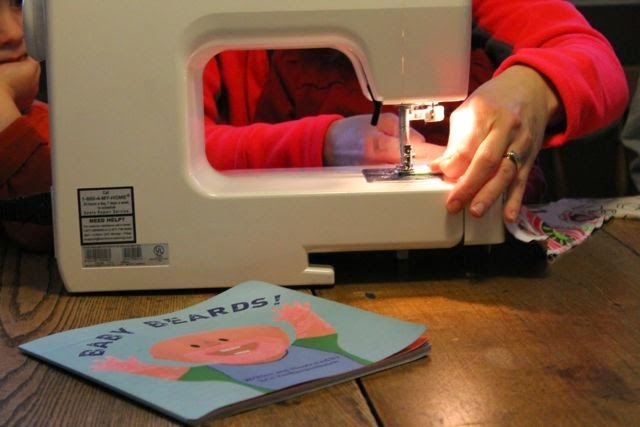 After many hours in the dining room with bottles of paint everywhere, and eventually a basement workspace I created for him for his birthday in 2014, Eric finished his fifth book, Baby Beards!. 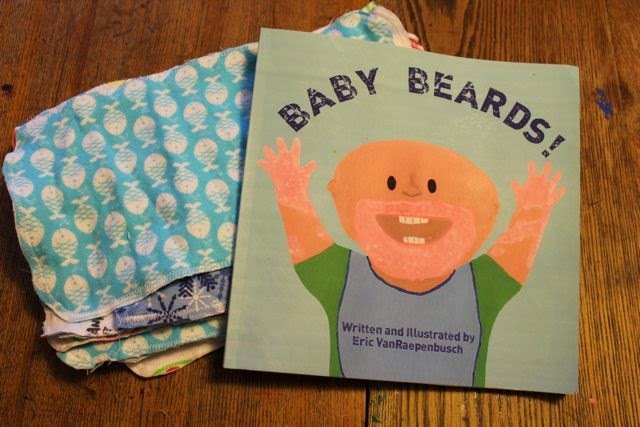 Baby Beards! was inspired by our third and fourth babies, who were constantly covered in food, creating little baby beards on their faces after meal times. Oatmeal beards in the morning, yogurt beards for snack, noodle beards at lunch and black bean beards for dinner were part of our daily life for many years. 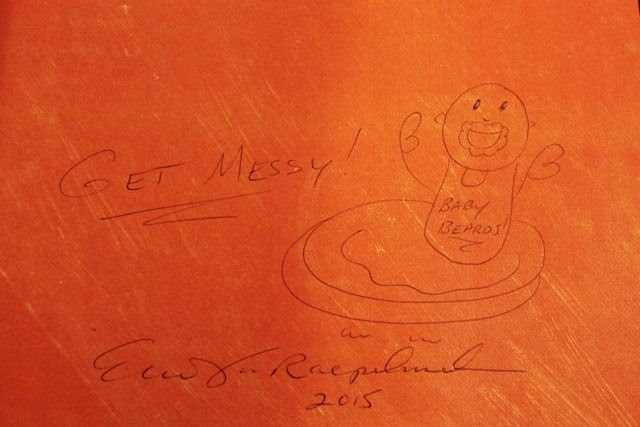 Eric was inspired to draw, paint, and create a wonderful book full of baby messes! Not only did Eric create an adorable book full of babies, messes and a super cute dog that appears on each spread, he also turned that book into a "baby book" with pages for moms and dads to record their own baby's first foods, add pictures of their best baby beards, and keep track of their child's favorite foods. Baby Beards! 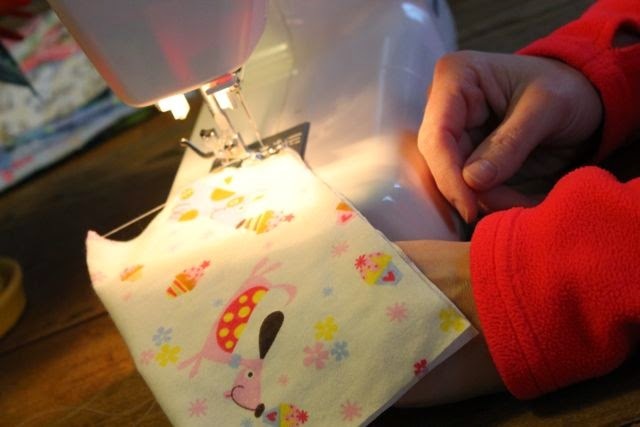 has turned into a wonderful baby shower gift for many moms to be! 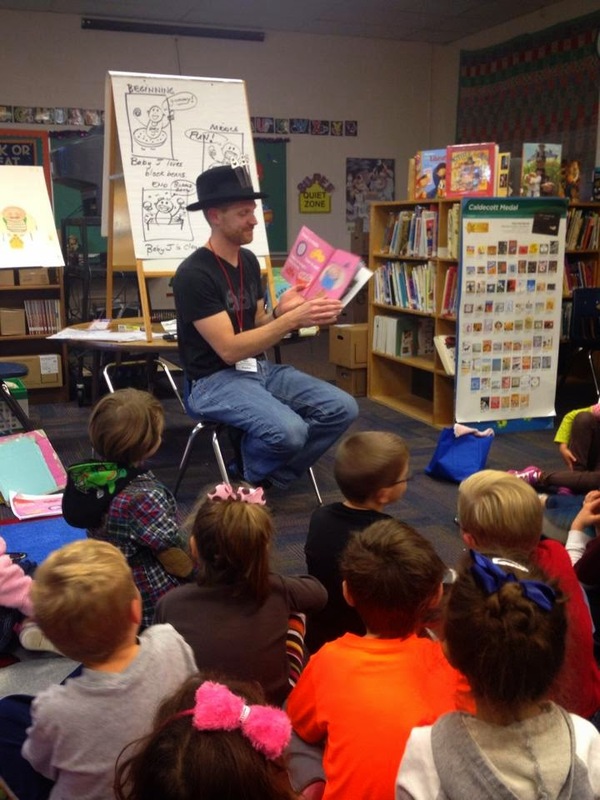 Since he self-published his book in the summer of 2014, he has also started doing author visits at local schools, talking about the process of taking a small moment in his life and turning it into a book as well as the process of how a book is created. He has presented at every grade level, Pre-K-4th grade in our hometown this school year and several other neighboring local districts! He is quickly becoming a local celebrity, with kids coming up to him while he is out and about saying "Hey, it's Mr. V! He wrote Baby Beards!" or "I remember when you came to my school and talked about black bean beards!" Eric lights up each time a child comes to him with a memory of something he shared with him. 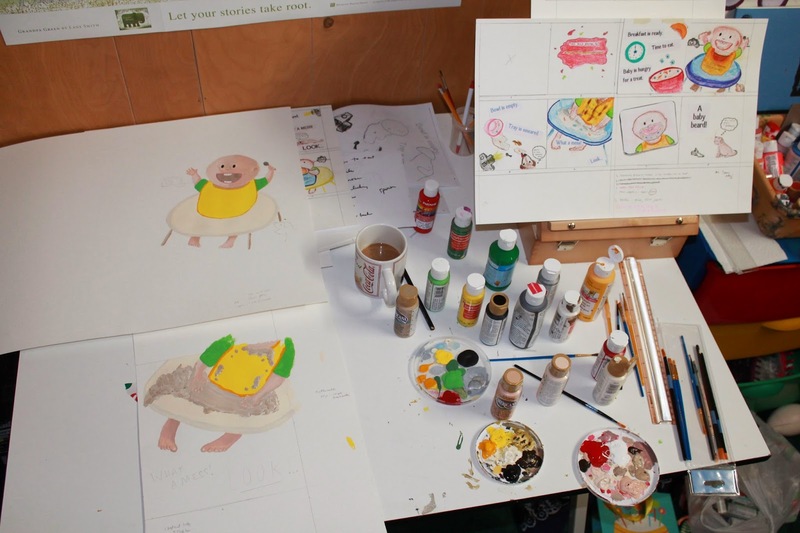 After reading thousands of children's picture books, studying over 250 authors for this blog, and spending countless hours of his life celebrating authors and illustrators, he is now one himself. Having a little child view him as one makes his day every time. How do you celebrate the birthday of the person who is the MASTER at coming up with original ideas to celebrate authors and illustrators? The only way I could think of was to ask the MASTER himself, and of course he had an idea! To celebrate Eric's birthday, he thought we would do something to help clean up those Baby Beards! and messes! We made messy cloths to wipe up those messy faces. Each time Eric signs a book, he signs it "Get Messy!" and draws a quick baby beard on the dedication page. 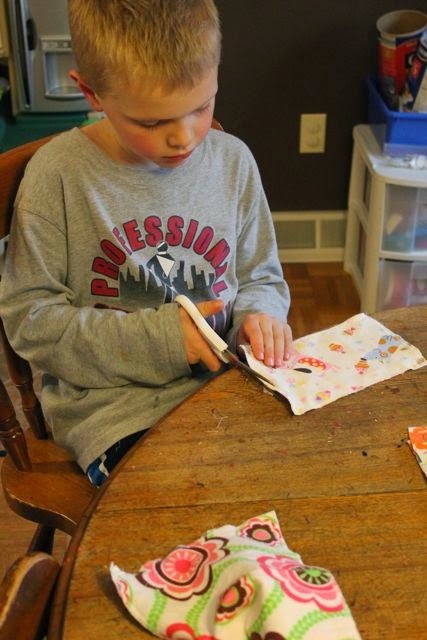 Making messy cloths was the perfect way to celebrate Eric's birthday. At our house, we have a drawer of "washcloths" that I made when our first daughter was a baby, 10 years ago. 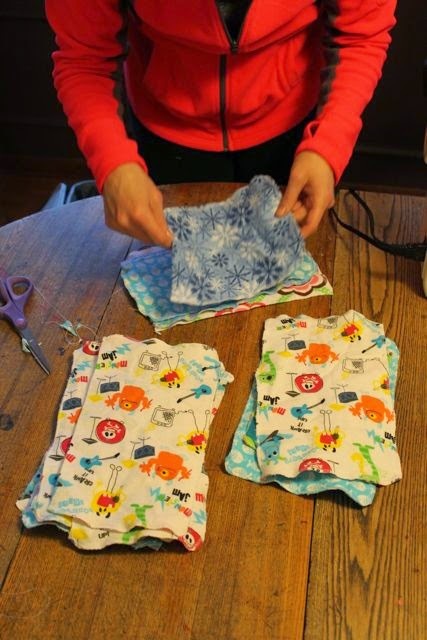 I surged together 2 pieces of flannel into small squares that were the perfect size for cleaning up a baby beard and the soft flannel was just right for wiping a baby face. That drawer has changed over the years, adding new messy cloths from time to time, throwing them away as they get a little too messy, but the drawer is always full. 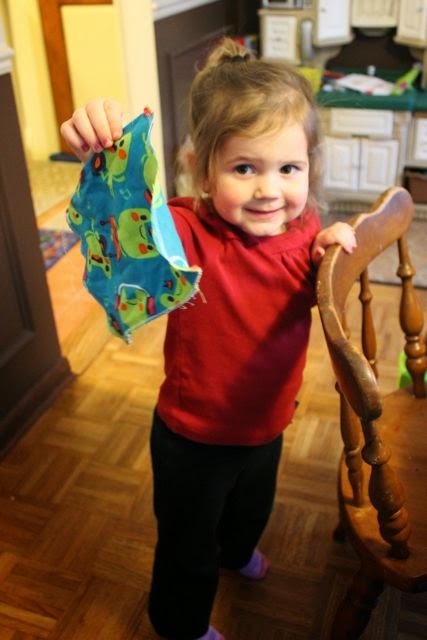 Our kids know to ask for "a washcloth with water" if they are sticky, messy, or need to clean up a beard of their own. It was time for us to refill our messy cloth drawer! 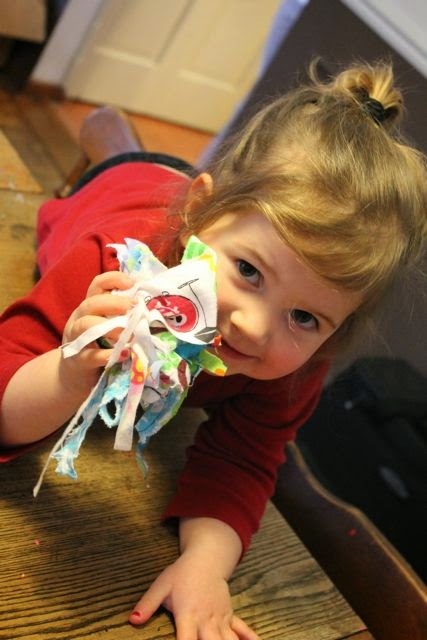 Our youngest daughter loves scraps, almost as much as her brother does. She was so excited to get her hands on the scraps that I cut from the edges of the flannel. I cut each piece of flannel to be about 12 inches long, give or take an inch. Each piece was folded over itself, to create a double layer. The final product was about 6 inches, but any size works great! My daughter was so excited we had birthday pattern for daddy's birthday! 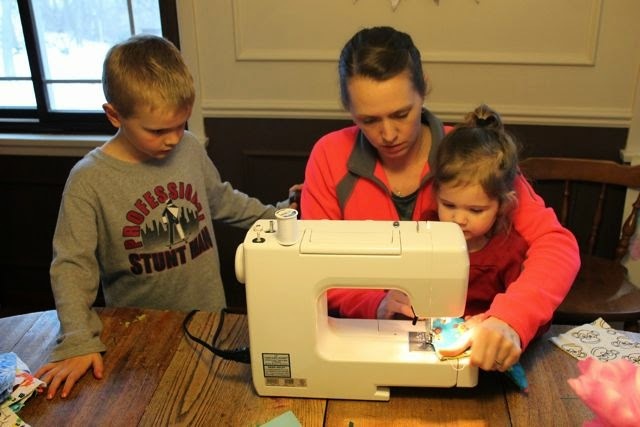 I started off by modeling how to use the sewing machine, but was quickly flooded with requests for "Is it my turn yet?" My oldest son wanted to do clean up duty by cutting off the extra pieces of thread. 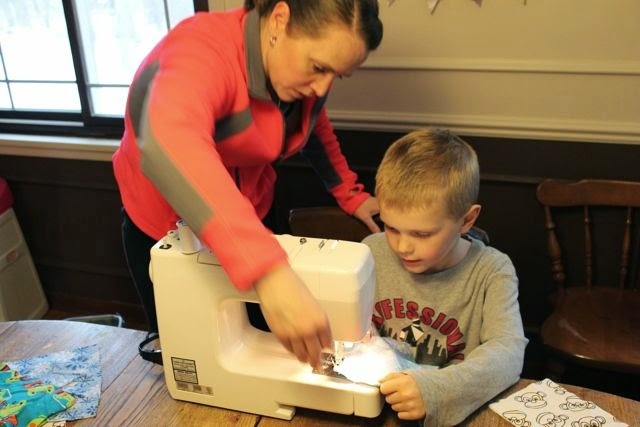 Then, he tried his hand at using the sewing machine himself. 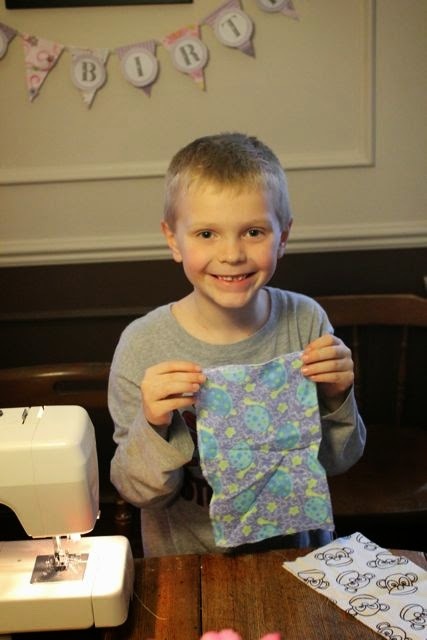 His first ever project made all by himself using the sewing machine! 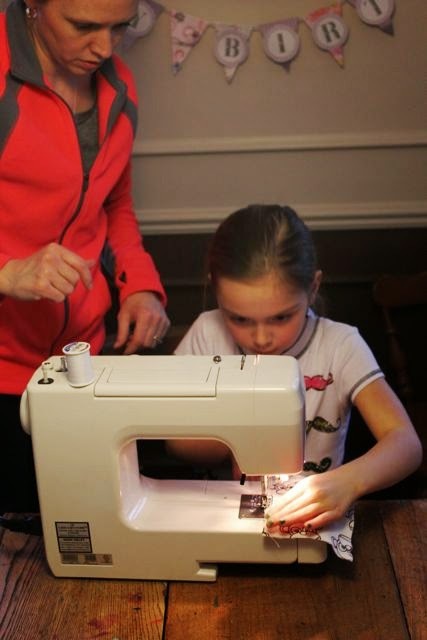 My oldest daughter has sewn before, with a very dear neighbor friend, but today was the first time she "flew solo" and used the machine herself. She was quite proud of herself for doing it without help. 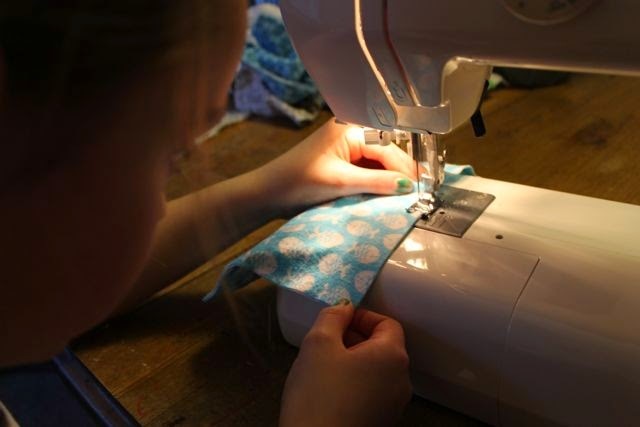 She asked if she could take sewing lessons this summer! The youngest can't be left out. Her brother worked the foot petal and she guided the messy cloth through the machine with some help. Look daddy, I did it! 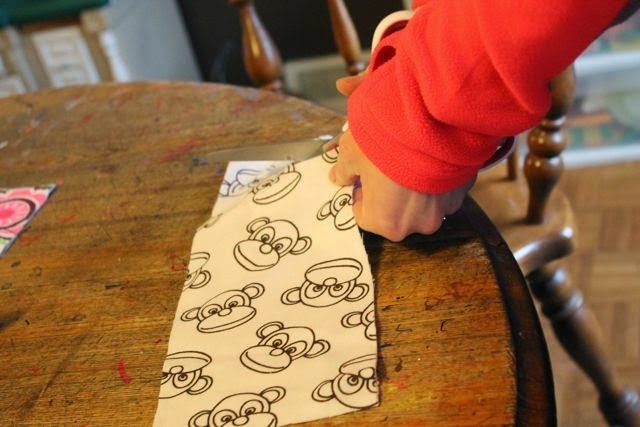 We needed a little quality control when we were done, but overall, they were well-made messy cloths! Happy Birthday, Eric VanRaepenbusch! I hope you have a wonderful birthday, full of cake and love. You are my favorite author and illustrator. I love you! Eric is doing a giveaway as part of his birthday celebration! 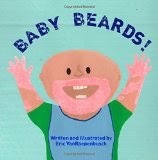 He is giving away an autographed copy of Baby Beards! 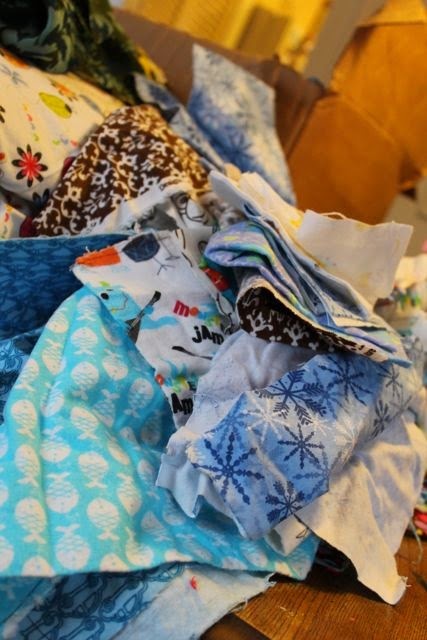 and a set of messy cloths to wipe up those baby beards! Do you have a baby shower coming up? Do you need a 1st birthday present? Do you know a young child that would love this book? 4. 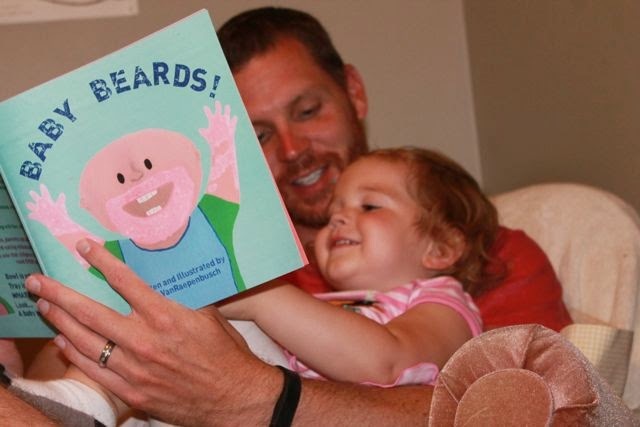 Read about how Eric made BABY BEARDS! - Start here!